← iPod Touch, a great alternative for iPhone? 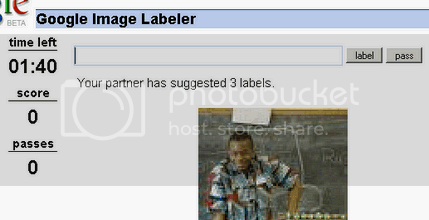 I just noticed a small link in Google Image search called Google Image Labeler! My curiosity won me over and clicked over to find out that it is an interesting game. Google actually wants us to help them index images better. So, instead of just asking people to label images randomly, they have made an addictive little game out of it. When you want to start doing some work for Google errr playing, you will randomly paired with another person. Now, you two will be shown the same images for 2 minutes and you have to label it as best as you could. The best suited labels that you and your partner match will earn the most points. At the end of 2 minutes, it will show you how much you have scored and your partner’s guesses for each picture shown! You don’t even have to log in to play this. There are plenty of time wasters on the web. Just one more to add to my list. This looks like another great time waster. Especially if both of you keep suggesting funny labels hehe.